DLP is proud to work with the partnership that Buick and the NCAA have formed to produce heartfelt, eye-opening commercial features that shed light on important issues and how sports figures can positively affect society. DLP produced 3 minute, 1 minute, and 30 second versions of three different features with more expected in the Spring.. Theses pieces originally aired on ESPN during the first commercial breaks of the most recent run of 30/30 documentaries. They can also be seen at ncaa.com/buick and have aired during sporting events on various networks including Fox. Lauren’s First and Goal is a non-profit foundation started by John Loose, a former All-American track athlete who’s now a defensive coordinator at a Pennsylvania high school and the father of Lauren, a 15-year-old pediatric brain tumor survivor. The Loose family started the foundation as a way to help other families who are battling childhood cancer. Since its inception, LFG has raised more than $1.5 million toward its mission to provide financial support for brain tumor research and cancer services. This mission is largely made possible through the funding gained through an annual LFG Football camp, which has grown into the largest football camp in the country. Football icons Urban Meyer, Archie Griffin, and Phil Simms have spoken at the camp. Wish of a Lifetime was started by college football standout and Olympic skier Jeremy Bloom. WOL enriches the lives of seniors through a vision to initiate cultural change by granting the wish of a lifetime to deserving seniors. This non-profit believes that most seniors have one thing in their life that they have always wanted to do or experience. However, and for many different reasons, many seniors never get to experience these dreams. The organization has granted over 500 wishes for senior citizens and data indicates that these experiences increase quality of life immediately and down the road. On this shoot Bloom took four Tuskegee Airmen back to Monton Field in Tuskegee, AL for the first time since World War II. You’ll also see a senior who always wanted to be an astronaut finally have an opportunity experience zero gravity. 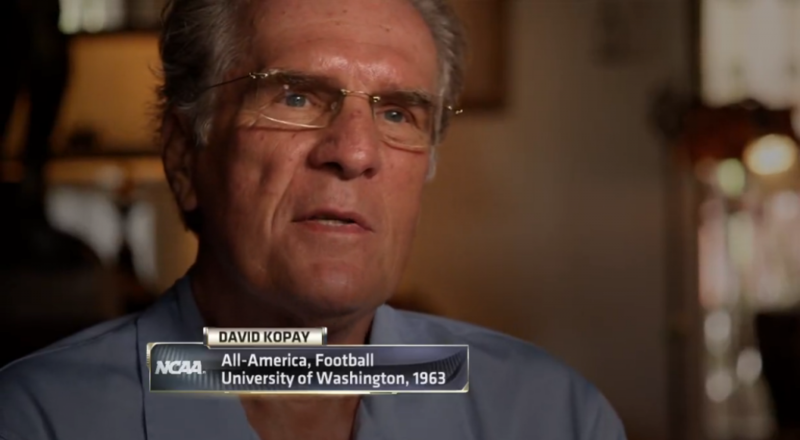 David Kopay is a former All-American football player at the University of Washington who played nine season in the NFL. After retiring David published a best selling book titled, “The David Kopay Story” in which he came out and became widely regarded as America’s first gay professional athlete. David has arranged for a $1 million endowment of his estate to be given to the University of Washington Q Center. The Q Center at his alma mater supports members of the LGBT community through advocacy, mentoring, and consulting with various departments on campus to bolster safety and respect for LGBT students. The Q Center also coordinates numerous programs, social organizations, and educational initiatives. It’s enlightening to hear David talk about the prevalence of hate in the 1970’s. It serves as a reminder of the progress society has made, and continues to make thanks to efforts by people like David Kopay and the University of Washington Q Center.